I'm the first to harangue against chocolate milk marketed as a healthy choice for children. Call me if you want a rant on the terrible health risks associated with modern meat production. Need outrage about deceptively fattening movie theater popcorn? I'm your woman. I've been known to send my children out of the house with a firm reminder never to accept the offer of fast-food hamburgers from strangers, or their own daddy. Hardee's famous 2/3-pound Monster Thickburger is just the sort of delicacy someone like me might fear: It's made of two 1/3-pound beef patties, four strips of bacon and three slices of American cheese on a mayonnaise-coated sesame seed bun. It weighs in at 1,420 calories and 43 grams of saturated fat -- more than double the daily recommendation for an adult. It's obscene. But do I think we need to be protected from Hardee's Monster Thickburger and other foods of its ilk? No. But that's exactly what Australian health officials want to do with the Thickburger's Aussie cousin, the Double Angry Angus. For those not familiar with Hungry Jack's, it's an exclusive Burger King franchisee in Australia (imagine the BK logo, but with "Hungry Jack's" where "Burger King" should go). The Double Angry is truly a monstrous burger, boasting "deep fried onion rings, two slices of cheese, two beef patties and several rashers of bacon." It contains 26 grams of saturated fat and 5.6 grams of salt. Once again, American excess wins. "This Type of Product Is Reckless"
Indeed, it's a lot more saturated fat (by 10 grams) and a little more salt (1.6 grams more) than the country's National Health and Medical Research Council recommends in a day, similar to U.S. Department of Agriculture guidelines. Yes, this hamburger is obscene. But does it deserve a warning label -- and perhaps even a government ban? Bruce Neal, chairman of the Sydney World Action on Salt and Health, thinks so. He cautions that eating it would immediately cause a rise in blood pressure. Regular dining on the mad meat sandwich would cause chronic high blood pressure, Neal tells the Sydney Morning Herald, and then heart attack, kidney failure and stroke (all three? one at a time? he doesn't say). "This type of product is reckless," he adds, "if manufacturers were forced to use front-of-pack warnings, they would reform their products pretty quickly." People need protection! is the message of a colleague in the cause of caution, Clare Collins, an associate professor in nutrition and dietetics at the University of Newcastle. She calls this and other similar fast salt-fat delivery mechanisms "monster foods" Of the burger, she says: "It should carry a message saying 'increase your health premium now because you'll need it for your coronary care.'" I agree that fast food -- eaten regularly and excessively as most Americans (and, evidently, quite a few Aussies) do -- is highly dangerous to one's health. But I have a hard time making the leap to heart attack warnings on foods like this. There's no message in any media insisting that such scandalous foods are either (a) healthy in any quantity or (b) a sensible choice for a generous portion of one's diet. We in America have practice in horrifying with such delicacies as the aforementioned Hardee's Monster Thickburger (107 grams of fat but a paltry 2.7 grams of sodium); Burger King's famousMeat'normous Omelet Sandwich (discontinued in the U.S.); and, perhaps coming soon to a KFC near you, the "Quadruple Down" -- a sandwich in which the bread (all four "slices") is actually fried, breaded chicken breasts, and the filling is bacon, two kinds of cheese and "special sauce." Each of these sparked a minor media frenzy and discomfort from nutritionists and food activists, but these reactions were comparatively mild. Of the Thickburger, one health safety activist told journalists: "Probably no nutritionist ever imagined that a product like this would be marketed." As if to thumb his nose at the potentially critical audience, Hardee's CEO Andrew Puzder told CNBC it was "not a burger for tree-huggers." 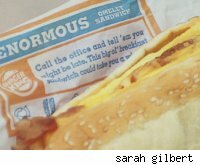 The Meat'normous Omelet Sandwich received a few mentions from diet watchers -- "Americans do not need" it, said a University of Pennsylvania nutrition professor, but most of the media focused on whether it was absolutely delicious or truly revolting. In much the same way, these sandwiches exist not as menu anchors, but as media touchstones. "Big and unapologetically decadent," they're meant not to get you eating them every day but to get you talking -- and to get thrill-seekers hurrying into the joint for a taste of the titillating treat before the worrywarts manning the complaint lines pull it from the menu. It's worth noting that the Australian health agencies have jumped on this burger not so much for its double-dose of saturated fat (that's kind of old-hat in fast food, isn't it?) but for its sodium. And here they're not quite as secure in their indignance. Many experts believe that salt isn't really bad for you at all. One study in particular demonstrated that typical sodium intake was better for heart patients than low-sodium diets, with mounting evidence that too little salt leads to depression. Far more dangerous than the rare Ginormous Angry Heart Hulks are the everyday burgers, fries and large soda that make up the diet of many, many everyday people. These unassuming, nonterrifying foods are still skulkingly dangerous. One (or even several, over the course of months) Double Angry Anguses won't kill you. But a daily diet of fast food shockingly low in nutrients and high in refined sugars and flours and unhealthy fats, probably will. Thatdeserves a warning label.